We’re back in grape growing country. And much of our walk today was through old and new vineyards. 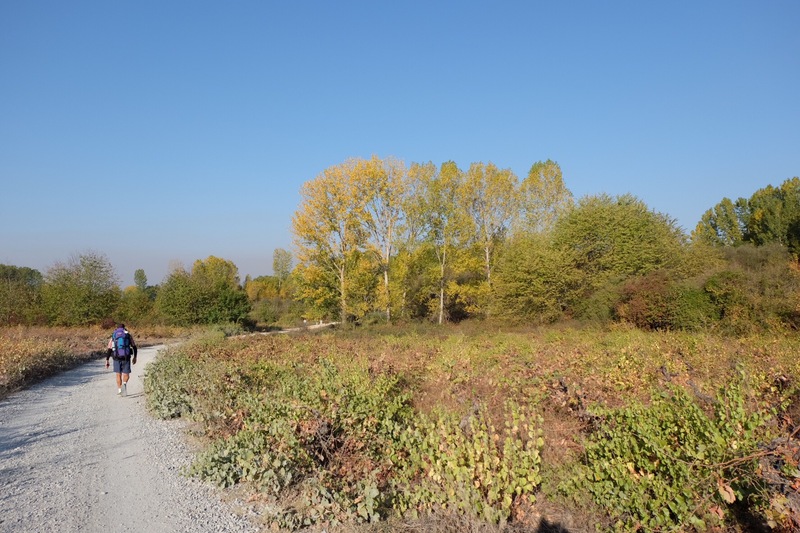 Together with the yellows of autumn in the poplars, willows, and oaks they made for a beautiful autumn walk. The way markers were sometimes easy to find. I think Puck sometimes had a hand in placing them. Although the yellow of the marker pops in this photo it was difficult to spot when we were trying to find our way. Actually, Puck was on my mind a bit during today’s walk. 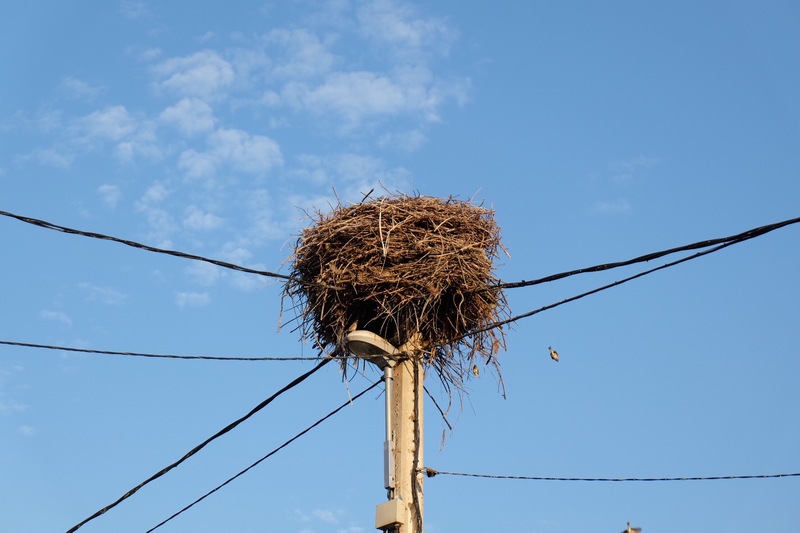 I imagined him giggling at the prospect of sparks, even fireworks, from the positioning of this particular storks’ nest near our morning coffee stop. 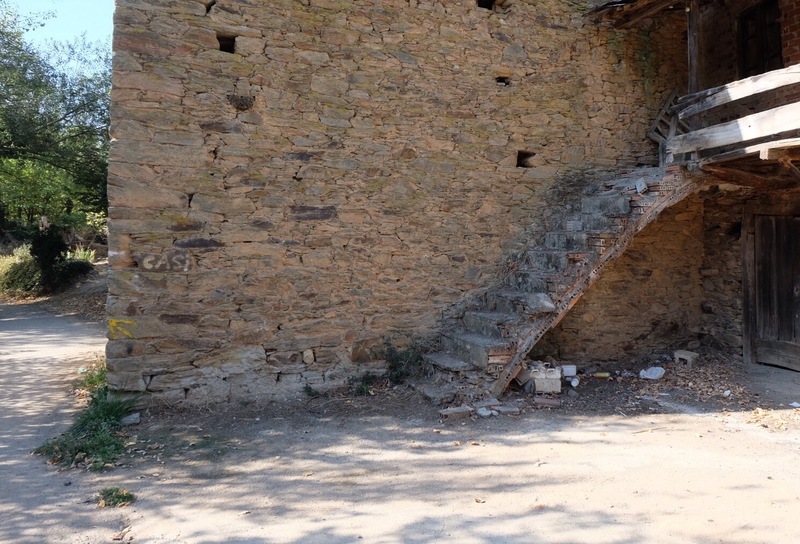 At nearby Fuentes Nuevas the church volunteer waved out to us rather insistenly. She wanted us to visit the church, and to stamp our credential. I’m glad we complied. The retablo was beautiful – it does have its share of gold, although not too much. 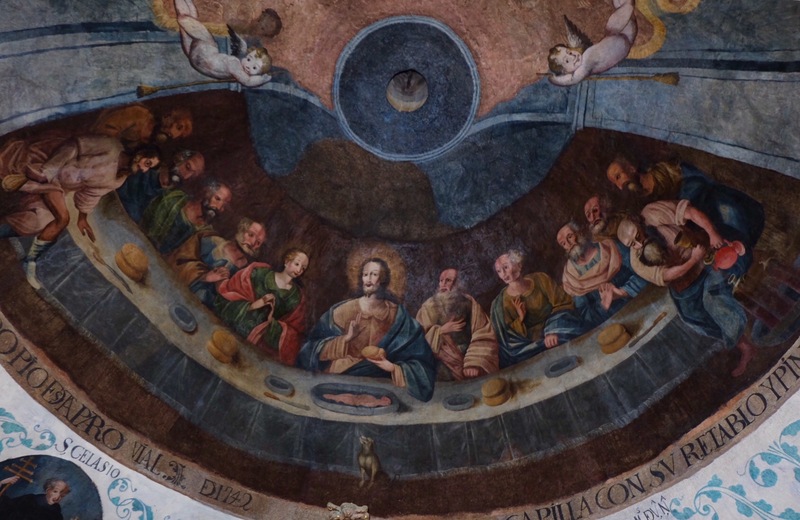 But, for me, this fresco stole the show. At first glance I thought the pilgrim statue had a puckish air. I mistook the set of his hat for jaunty. It was only later, when I had a closer look at my photo, that I realised he was bone weary and injured, not unlike a lot of us along the way today. The approach to Villafranca is among the most beautiful yet. 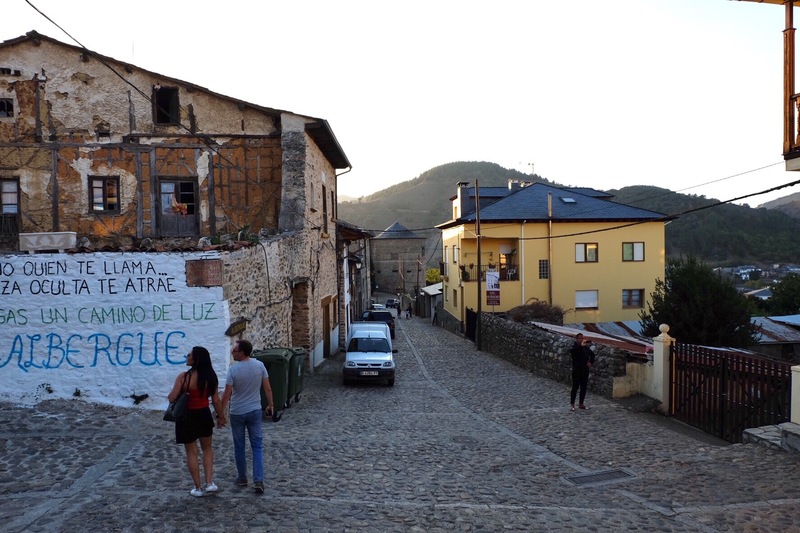 The town is filled with ancient churches, ancient buildings, and it has a castle. I was pleased, relieved might be the better word, to reach our albergue. It’s at the far end of the town and we needed Google’s help to find it – the map in our guidebook proving puckishly unreliable. 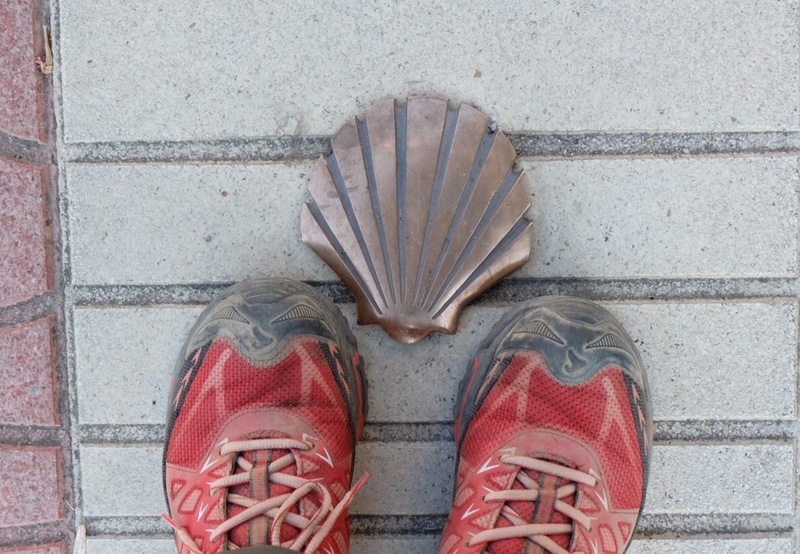 Tomorrow we’re planning to walk 20ks to Herrerias. The nest location is indeed scary. And you spotted it. Always observing the details around you. 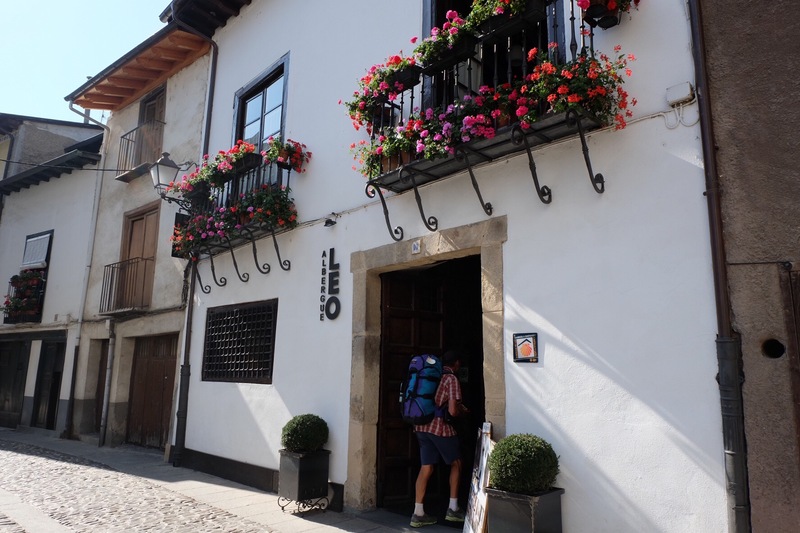 The albergue looks cosy and might have given the rest you needed for the upcoming 20k walk. Glad to see the good weather continues for you. 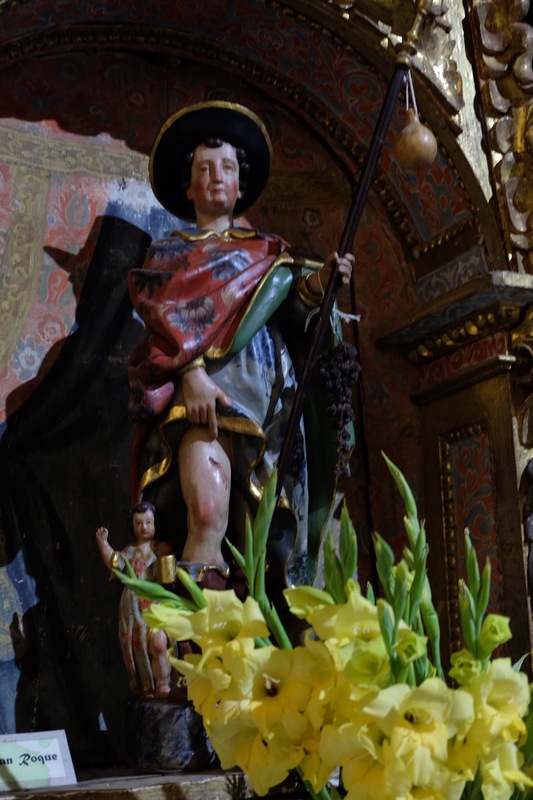 That’s certainly a nasty wound on the pilgrim statue. Hope nothing like that awaits you!